In this book, the author of Seven Gothic Tales gives a true account of her life on her plantation in Kenya. She tells with classic simplicity of the ways of the country and the natives: of the beauty of the Ngong Hills and coffee trees in blossom: of her guests, from the Prince of Wales to Knudsen, the old charcoal burner, who visited her: of primitive festivals: of big game that were her near neighbors--lions, rhinos, elephants, zebras, buffaloes--and of Lulu, the little gazelle who came to live with her, unbelievably ladylike and beautiful.The Random House colophon made its debut in February 1927 on the cover of a little pamphlet called "Announcement Number One." Bennett Cerf and Donald Klopfer, the company's founders, had acquired the Modern Library from publishers Boni and Liveright two years earlier. One day, their friend the illustrator Rockwell Kent stopped by their office. Cerf later recalled, "Rockwell was sitting at my desk facing Donald, and we were talking about doing a few books on the side, when suddenly I got an inspiration and said, 'I've got the name for our publishing house. We just said we were go-ing to publish a few books on the side at random. Let's call it Random House.' Donald liked the idea, and Rockwell Kent said, 'That's a great name. I'll draw your trademark.' So, sitting at my desk, he took a piece of paper and in five minutes drew Random House, which has been our colophon ever since." Throughout the years, the mission of Random House has remained consistent: to publish books of the highest quality, at random. We are proud to continue this tradition today.This edition is set from the first American edition of 1937 and commemorates the seventy-fifth anniversary of Random House. 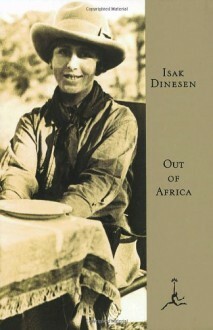 Karen Blixen's beautiful memoir about her years in Africa. Gorgeously written, Out of Africa is evocative of a the bygone era of European colonialism. One day I hope to write a book about my years spent in Africa! Till then read this.